Stowe. Unspoiled, beautiful, peaceful — a Vermont community accustomed to hosting special occasions. Quiet and secluded, Stone Hill is known for its intimacy and charm, perfect for elopements, engagements, and honeymoons. A luxurious nine-room retreat surrounded by forests and gardens where you can exchange your vows along garden paths or next to our glistening waterfall. Winter ceremonies are highlighted by falling snow within a forty-windowed room or by the warmth of the Great Room in front of the fireplace with candles. In addition to the bride and groom, our small wedding ceremonies accommodate six additional guests. Choose from our packages below or call us to customize your perfect Vermont elopement. Enjoy an uncomplicated approach to your wedding with our elegant yet simple elopement package. 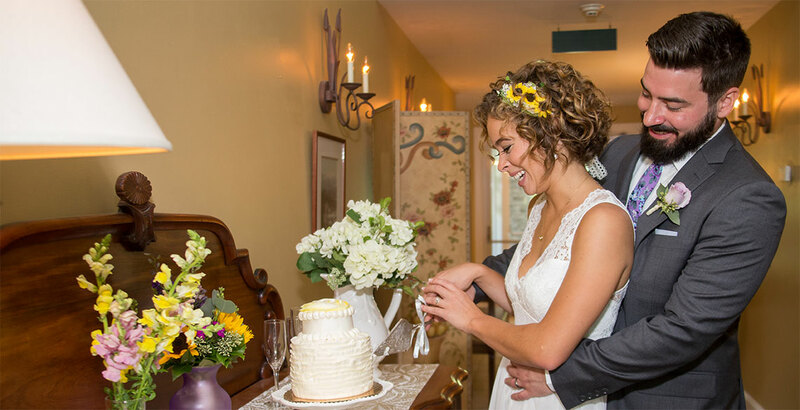 Celebrate your love in beautiful Stowe, Vermont and let us handle all of the details! Book our Roses and Memories Elopement Package, and then choose one or more of our memory-making Adventure Enhancements to make your elopement completely unique and unforgettable! My new wife and I chose the Stone Hill Inn for our elopement after it popped up on a search for the best places to elope in New England. They lived up to the hype in every way. They gave us a thorough personal tour of the grounds and told us to do whatever we liked for our ceremony, hung the dress in the innkeeper’s personal closet, altered the breakfast menu to offer 2 vegetarian options for us, and spent our wedding day making sure we had everything we needed including an extra room for me to get ready in. All of the little details like a kitchen stocked with free snacks and drinks to giving us a vase to take the bouquet home in were things that I have never been offered by even the nicest city hotels. This inn was a splurge for a special occasion, but my wife and I left feeling like it was worth every penny. We look forward to coming back soon! We traveled all the way from Oregon to get married in Vermont. We were so lucky to find Stone Hill Inn. 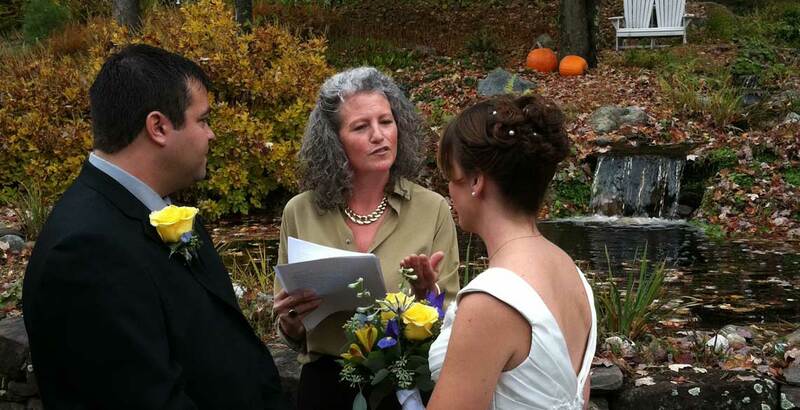 We got married in a very informal and sweet ceremony in front of their backyard waterfall among the beautiful Vermont fall colors and brilliant sunshine. It was so perfect, my husband wanted to renew our vows the next day! We’ll be back for an anniversary celebration! My husband and I spent months researching various venues for our intimate wedding, and finally decided on the Stone Hill Inn thanks to the wonderful reviews. We were not disappointed! Our experience and stay was more than we could have ever imagined! We were greeted immediately with a comfortable warm welcome. 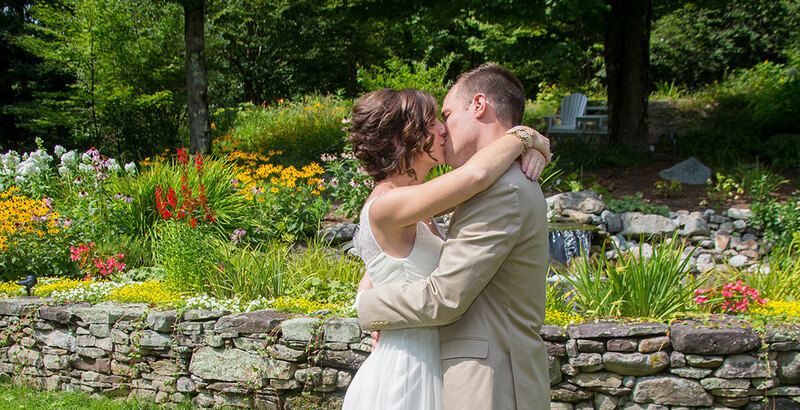 We chose to visit Vermont for the first time and elope at Stone Hill Inn. Their elopement package includes a good amount of small gifts and a cake and bouquet for your special day. We couldn’t have had a more special day for just the two of us. They make you feel at home. For the price we paid and the three nights we stayed it seemed very reasonable! They serve you fresh warm breakfast every morning made by themselves. Let me tell you, their food is five star amazing! Out of this world! The rooms are a great sir for just two people and they offer a fireplace and jacuzzi. The yard surrounding the bedrooms is absolutely gorgeous and so relaxing. I think the best thing about this Inn is that there are only a handful of rooms and no children ( even though I love children , a vacation is great without crying babies or children yelling! ) (: We honestly couldn’t have asked for better service, food or a good night’s sleep before our wedding day. We will be coming back soon and wouldn’t chose a different place to stay.